A slim client can be used in the attendance system. You can view the attendance of employees through an internet browser, as well as ask for holiday, approve attendance, etc. Customers using the canteen or wage systems can use a common web interface for all the applications. It is sufficient to sign up only once and all the information is in one place. The application enables the personal data of employees to be viewed. Such information includes the employee’s name, surname, date of birth and other information. The data to be viewed through the intraweb are set in the Docházka software. Through the application it is possible to get an overview of all operations (events) that were registered by the attendance terminal and that were entered by a user into the original attendance or intraweb application. This considers operations such as Business trips, Departure, Work, Holiday and similar. 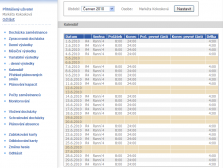 Various monthly periods can be viewed with the aid of a roller menu and the Setting button. The intraweb shows and overview of processed attendance data. The list shows individual days within a month and operations performed on those days. The worked hours are shown in brackets. Beginning, end, real and calculated value and assigned shift which influences the rounding of the interval is defined for every processed interval. All these characteristics are set by the system according to defined rules. You can choose the time-period for which the data on processed attendance is to be shown at the top of the screen. The application shows data on day-to-day results of an employee. Worked hours within an individual day in a month are shown. The lower part of the list displays a summary of hours for each column. The left part can show coloured marks, which are used to indicate days for which the attendance was approved and the level it reaches. There are three attendance levels (green, yellow, red). Values can be edited after setting. It is possible to choose the time period for which the daily result data should be displayed. The intraweb shows overall data on processed attendance. The list shows codes (indications) and a written description of the time-bound part that explains the use of it (worked hours, overall overtime, etc.). Other data in the columns is linked to a specific time-bound part and value is calculated on the basis of characteristics of the part. In case the company uses variable time-period (for example a week) the software enables the overall data on processed attendance to be shown for the chosen variable period. Variable results display the same information on attendance but for a different time-period than the monthly results. In case the company uses variable time-period (for example a week) the software enables the overall data on processed attendance to be shown for the chosen variable period for individual employees. Variable results display the same information on attendance but for a different time-period than the daily results. the shift duration in HH:MM format; the length of shift determines the number of hours within a working hours fund. The shift length does not have to correspond (and mostly it does not) with the calculation of the difference between the beginning and end of a shift. The difference is caused by compulsory (registered and unpaid) breaks at work. The application shows a list of planned shifts. The same data can be found in the planned shifts overview as in the overview of planned capacities in other viewpoint on the data. The columns of the planned shift overview are similar to those in the calendar. 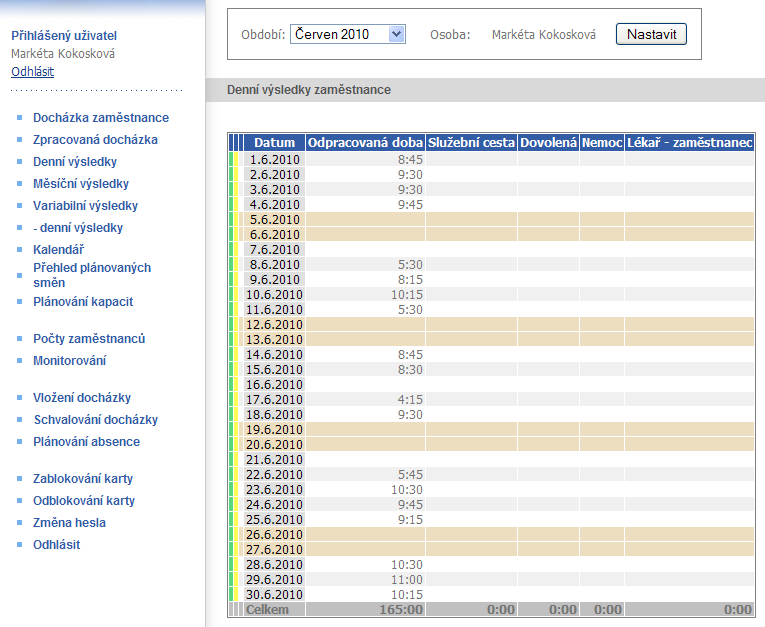 You can view the planned capacity for a given month through the intraweb. The overview shows the employee and planned shifts for him/her within the given month. You can find explanatory notes under the overview that describe the used acronym for planned shifts. According to the software, setting multiple employees can be shown in the list. 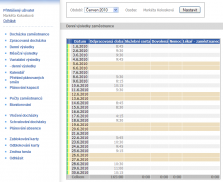 The application shows the number of employees for an individual day within the selected month. Days are listed with data on how many employees were working or were on holiday. For example 22nd June 2010 15 employees were working and one was at work for half the working day (15,50). The lower part of the list shows the overall numbers of employees. This shows the total number of employees who were working or were on holiday in the selected month. Each column is set in the Docházka application. You can select the time period for which the data is shown and how the information will be divided in the top part above the list. The intraweb enables you to monitor the presence or absence of employees at the workplace. For example when the data from the terminal is read every two minutes, you can display the current presence of employees within the workplace with a maximal delay of two minutes. The list can show employees present/absent or all. You may choose only employees of a selected division (centre). The list shows the actual presence of employees and an overview of performed operations. The number of present and absent people is shown under the list. The intraweb enables you to manually insert attendance to an authorized extent. To do this, set in the Docházka software the date and time of an operation which can be selected. Then select an operation and insert it into the original attendance. Within the setting you can allow attendance insertion for multiple days and for a selected person from a list. The approval is shown in the left part of the Daily results list. Any absence can be easily planned and inserted into the database with the aid of the application. The type of absence (Holiday, Compensatory leave) is selected from the list, the from – to dates are set and inserted into the database. The planned absence is then shown in the list of planned absence. You can also cancel the absence from the list. A complement to the standard version of the intraweb enables the possibility to print output sets in pdf format. Sets displaying individual attendance and a summary set showing a list of all employees with their monthly attendance are offered as standard.